The scientific and technological objectives of ROBOFOOT are addressed through 7 work packages to be developed during 30 months. In the Figure below the inter-relations among the WPs is shown. The work packages are broken down in defined tasks with their own task leaders according to their specific role within the project. Five of them correspond to RTD activities (WP1 to WP5), one to Demonstration (WP6) while management and dissemination activities are grouped in WP7. At the top of the RTD plan there is a work package (WP1) devoted to user requirements identification, definition of use cases and scenarios in detail as well as to the definition of metrics that will be used in the validation process. 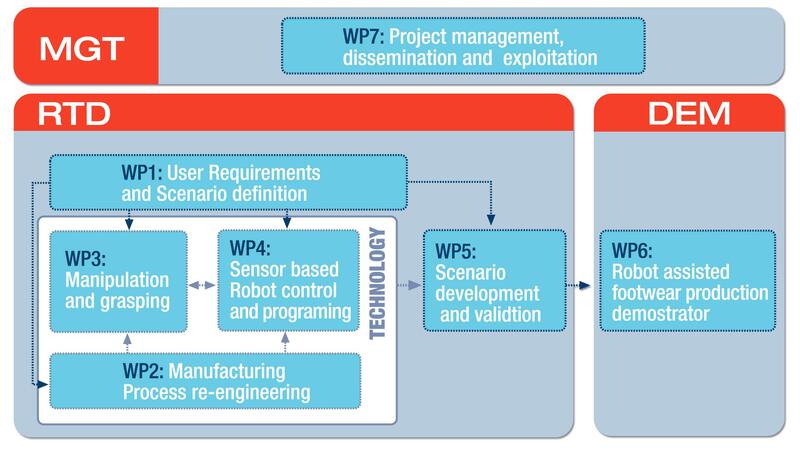 Three technology driven packages, related to process re-designing (WP2), manipulation and grasping (WP3) and Sensor based Robot programming and controlling (WP4). A system integration and validation cycle is foreseen (WP5) through several use cases in different industrial scenarios. The consortium considers fundamental to have partial implementations available at early stages of the project. It will contribute to make complete integration easier and to the dissemination of the results in the European Footwear Industry. To achieve this objective we foresee 3 incremental prototypes at each end user scenario that will be independently evaluated and will be used as input for further integration tasks. The “Design & Mass customisation Laboratory” (D&MC Lab), a pilot factory that covers the entire spectrum of development and production activities of mass-customised shoes. The prototype of robotic based last and components manufacturing set-up by INESCOP. The aim of this WP is to identify end user requirements, to define in detail the scenarios and use cases that will be used to validate the solutions proposed by ROBOFOOT and to establish the metrics that will be used during that validation process. In order to integrate robotics in the manufacturing/packaging process, the way in which they are done and the production means used might need to be redefined. This WP deals with this goal that includes interoperability between modules and safety considerations. This research activity will address mainly the problem of manipulating and packaging non-rigid parts. It involves the research both on the algorithmic and on the technology side to make possible the development of gripper strategies and prototypes for the targeted application. The aim of this WP is the creation of new intuitive and adaptable robot programming and control methodologies and tools specifically designed for the footwear production. Exploiting the functionalities of the COMAU C4G Open Controller the WP will create new programming solutions specific for the footwear production integrating the information from CAD/CAM systems and from on-line sensors. Besides that, innovative control algorithms will be implemented to take into account the sensorial information. The scenarios identified and defined in WP1 will be developed in this WP integrating the technical achievements of WP3 and WP4. For the success of this task, it might be necessary to modify the manufacturing process according to WP2 outcomes. Three prototypes will be developed and evaluated, being the first one scheduled by month 18. A demonstrator will be developed to be presented in different fairs and events, in particular for the dissemination activities in the SIMAC-Tanning-Tech Fair in Bologna. This annual “International exhibition of machines and technologies for footwear, leather goods and tanning industry” is considered the most important in the sector. The aim of this WP is ensuring the project meets its goals and overall objectives. It includes and implements all management activities. Formally the WP combines both the management and dissemination activities. Proper use and exploitation of the project results in accordance with the Consortium Agreement will be defined.